If you are planning summer school, be sure to take a look at the Summer Climb™ Summer School Curriculum. Every Footsteps2Brilliance teacher has access to 4 weeks of daily intensive literacy lessons and resources for students exiting k, 1, and 2. After you log in, open "Teacher Resources" and click "Summer Climb." With the research-proven Footsteps2Brilliance early literacy app at its core, Summer Climb delivers a robust blended learning solution that is easy for teachers to implement and fun for students and families. What is included? Each daily lesson plan outlines blended learning activities focused on: Reading and comprehending narrative or informational text; developing foundational reading skills; and applying new understanding to create and publish narrative or expository writing. 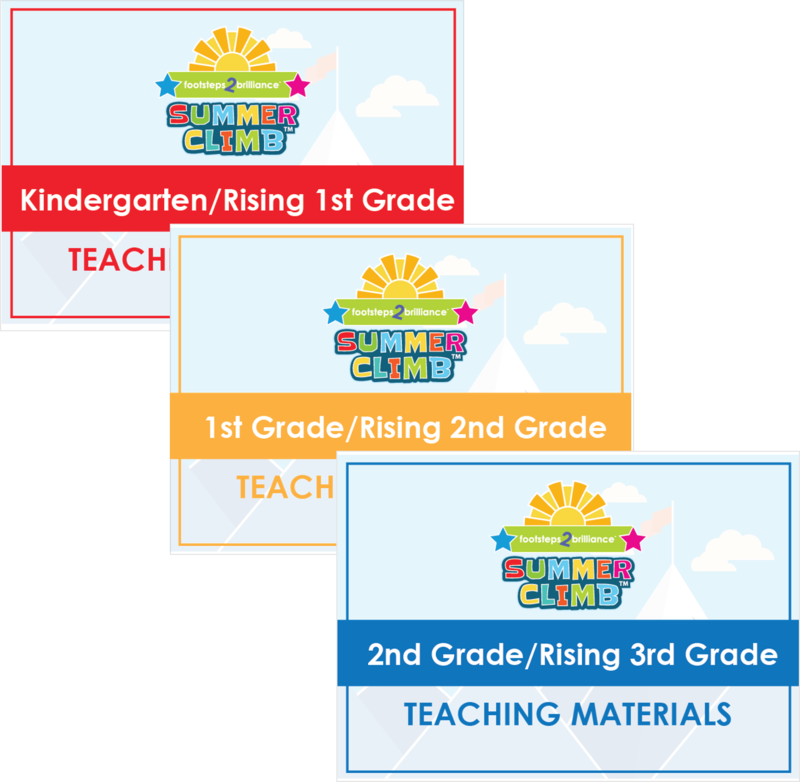 Printable Activity Sheets and Lesson Materials: Summer Climb provides teachers with a comprehensive set of graphic organizers, fluency passages, game cards, and activity sheets that make lesson preparation a snap. If you are looking for a fun and easy way to get families using the app this summer, check out our Footsteps2Brilliance Reading Race Progress Tracker charts in the Teacher Toolkit under "Teacher Resources". These charts make it easy for parents to mark off each time their child uses the app. Washington Unified School District in California is one of many Footsteps2Brilliance districts that is challenging their students to read on the app this summer. Every student will take home a Summer Reading Race Progress Tracker chart to track each time they use the Footsteps2Brilliance app. Students who return their completed chart (and show usage in reports) will receive a special Back-to-School Kit that includes a pencil case, pencils, and earbuds. To add a little extra incentive, Washington Unified has announced that the top reader in each grade will win 1 of 3 Kindle Fire HD8 Kids Edition Tablets. 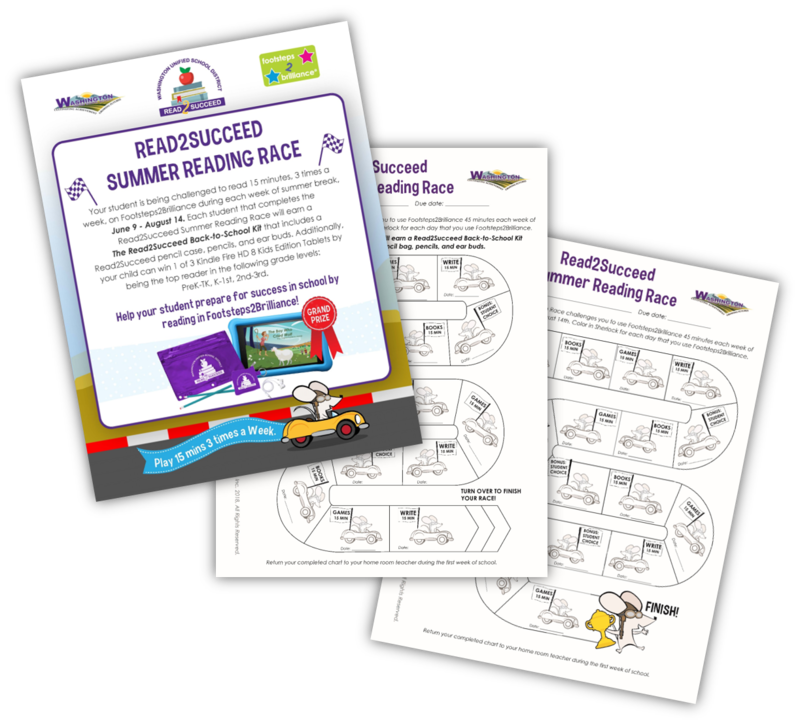 Whether you are a teacher, a principal, a district admin, or even a community partner, you can combine the reading chart with a fun incentive to keep families motivated to learn on the app this summer. Announcing a community-wide reading goal is a brilliant way to bring your entire community together to support early literacy. 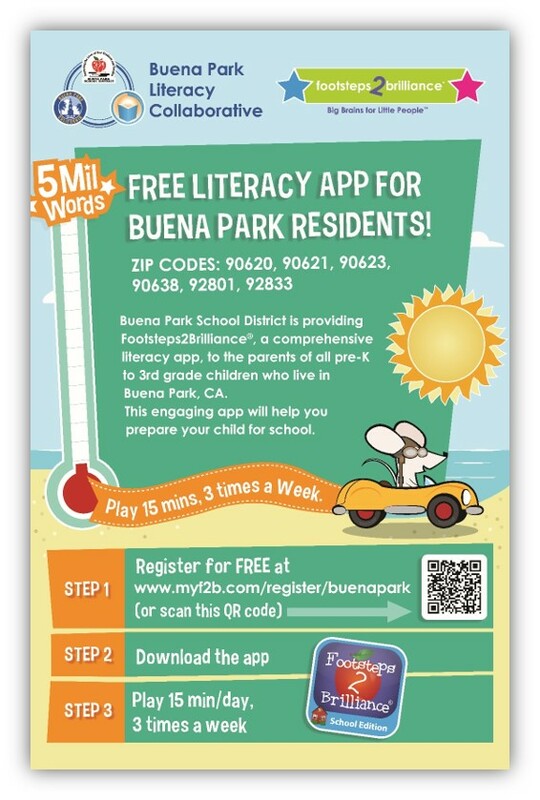 Cities like Buena Park are challenging their community to read over 5 Million Words this summer on the Footsteps2Brilliance App. Buena Park School District sent flyers to all of their families, local businesses, and key stakeholders inviting families to participate in their challenge. Anyone can easily check progress toward the goal on the district website where Footsteps2Brilliance words read dynamically update every hour. Based on our experience with districts across the nation, we expect Buena Park will be celebrating big reading numbers next fall! As you are winding down your school year, don't forget to prepare your families for a summer climb! At Footsteps2Brilliance, we believe that every child can avoid falling behind over the summer with high-quality learning resources and a little motivation. Let us know how are you going to use Footsteps2Brilliance this summer to combat the summer slide. Posted in Early Learning Technology and tagged early literacy, footsteps2brilliance, phonics, summer climb. I was lucky enough to run (teach) a program that used F2B for 3 years. Now I am back in the classroom and would like to use the program because I know how well it works. In the past, all of the students I had are now performing on or above their current grade level. It is the repetition and the fun that entertains the students and keeps them wanting more. I miss this program. I want it back !